Dr Bob Gill who has worked for the NHS for 24 years, and is currently seeking crowdfunding for his documentary film, The Great NHS Heist, was interviewed as part of a short video presentation produced by the UK journalist co-operative, Real Media. 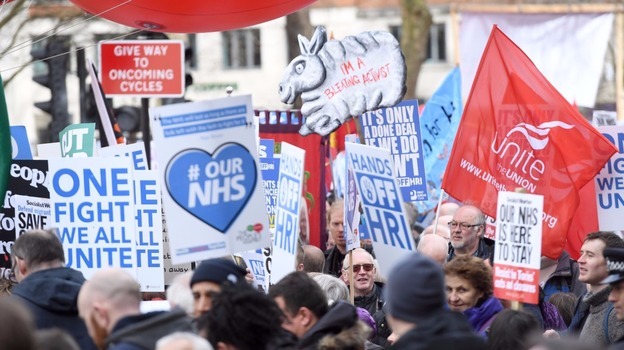 In the interview, Dr Gill discusses how the move towards privatizing the NHS has been an agenda-driven project continued over many years by successive Conservative and Labour governments’. The intention of successive governments’ has been to transform a publicly-funded free at the point of delivery healthcare system into something that is driven by the need for profit. The privatization agenda has been a well-planned long-term project. Successive governments’ have understood NHS privatization is not in the public interest and thus they have devised alternative narratives in order to deceive the public. A key component of this deception has been the deliberate cultivation of a ‘scapegoating’ culture in which the elderly, immigrants, overweight etc are blamed for government under-investment in the NHS. This lack of investment is portrayed in the media as NHS Trust ‘overspending’. The hospital network has been deliberately saddled with toxic loans. In legal terms, the 2012 Health and Social Care Act abolished the NHS. The result was the emergence of a Quango headed by NHS England’s Simon Stevens who has the day-to-day power of managing the service. In 2014 Steven’s introduced a five year ‘Sustainability and Transformation’ Plan (STP). The STP will move the NHS closer to the private US insurance system through a process of re-structuring, dismantling, integration, means-testing and merging of existing NHS services. Both the NHS workforce and the general public are largely unaware of these plans which have been made deliberately complex and drawn-out over many years. This drawn-out complexity is yet another part of the plan to deceive the general public and NHS staff alike. NHS reforms are reported in the media in a positive way. This is despite the fact that the said reforms will result in the destruction of the service. The British Medical Association (BMA) is largely complicit in the privatization agenda. Jeremy Hunt, whose powers are limited, is being used by the media as a distraction. Simon Stevens, who has the real power, has been deliberately set-up by the media as a ‘saviour’ for the NHS, whereas Hunt is portrayed as the ‘bad guy’. Simon Stevens ambition for the NHS is to hand it over to his former colleagues at United Health in the U.S and the U.S insurance industry. The NHS is subject to competition law and is under constant threat from internationally negotiated trade deals. The service is geared-up to work against the interests of the patient. The NHS is heading in a direction in which doctors will be incentivized to deny patient care. The introduction of the principle of private insurance will result in a more expensive system with worse outcomes. The plan to fully privatize the NHS is “endemically fraudulent”. Dr Gill alludes that the deliberate asset-stripping of the NHS ranks as one of the greatest crimes inflicted on the British people. The jewel in Britain’s crown is being whittled away in front of the public’s eyes. All the while the Conservative government has convinced large swaths of the public that Simon Stevens is the saviour of the service when in truth he is its principal destroyer. Like a TV illusionist, the government is involved in an incredible sleight of hand – some may say, collective hypnosis – of the British people. The Health Secretary, Jeremy Hunt, is essentially a public relations figure for the government and the corporations it represents. Where the blows of both NHS workers and the public alike would arguably be better targeted is towards NHS England boss, Simon Stevens, whose power to be able to shape the future direction of the NHS far exceeds that of Hunt. Although it’s highly encouraging that an estimated 250,000 people attended one of the biggest national demonstrations against NHS cuts in London in March last year, it is somewhat perplexing to this writer why Labour’s Jeremy Corbyn in his otherwise excellent post-demo speech, failed to mention the nefarious role played by Stevens which is crucial to the entire NHS debate. How is it possible for activists and campaigners to get anywhere near the bulls eye with their arrows when the correct target hasn’t even been identified by the leader of the opposition? « Moving full steam ahead towards the disastrous U.S healthcare model?